Twenty-six strands of lights and the entire ornament collection all in six hours, to the accompaniment of the “Christmas favorites” iTunes playlist and a lovely dinner of Thanksgiving leftovers. Oh, and a brief pause to watch the lighting of the Westlake tree, the Space Needle, and the KING5 broadcast tower atop Queen Anne Hill. 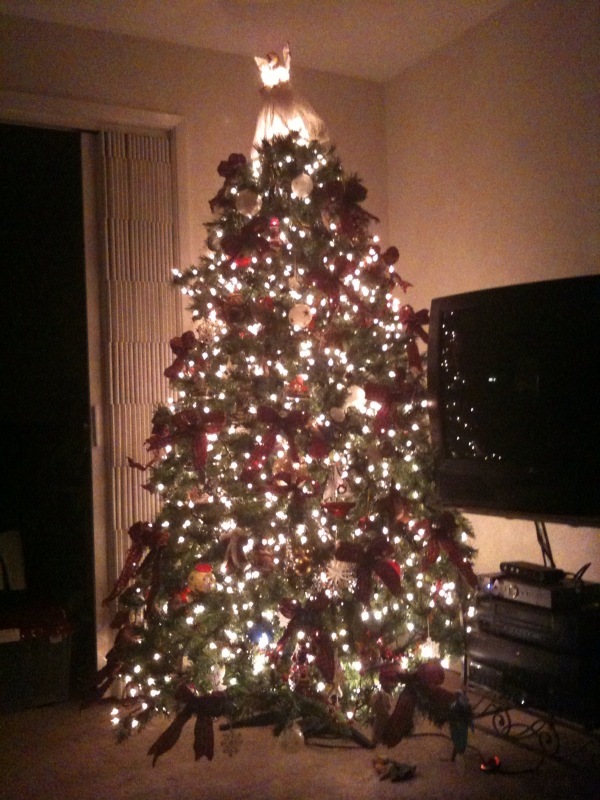 Last year Julie Anne had 28 strands of 100 lights each on her tree. This year she’s about a third of the way through stringing the lights and just put strand No. 10 on the tree. Right on track! Must be the holiday season? This morning we stopped at Starbucks for eggnog lattes and at Target for Christmas lights, candles, and a wreath and hanger. Now back at Julie Anne’s discussing the particulars of her holiday decorating plans before we retrieve the dozen or so Christmas boxes from her storage unit, all while she’s mixing up a batch of home-made bread and Christmas songs waft from the living room. Definitely that time of year! Flickr: Don NunnJulie Anne’s home-made cinnamon rolls fresh from the oven. Her firsttry at scratch-made looks and smells pretty freakin’ good, evenbefore they get their light drizzle of icing. Newly cleaned burners and drip pans in place, a quick test of the burners to be sure we have them seated properly. Crazy day of cooking may begin now! There really IS “an app for that”. Ah ha, the power was out! No wonder my microwave and stereo were doing the 12:00 --:-- 12:00 --:-- 12:00 --:-- 12:00 blinkies this morning. Kind of weird to find out about an immediately local event via the newspapers a few hours after it happened, though. And I suppose it’s a good thing I use my phone as an alarm clock.